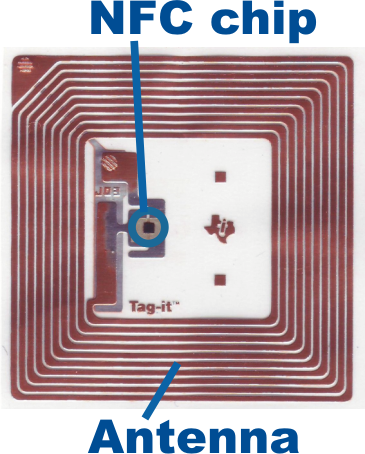 NFC tag includes a small memory chip attached to an antenna. NFC reader (e.g. mobile phone with ) activates the antenna and chip with its electric field. This enables content to be transferred from chip to reader, activating the specific functionalities put on the tag. Such functionalities can be for example phone calls or sending SMS to defined numbers. NFC phones activate tags when the phone touches the tag (“NFC touch”) from a 1 to 5 cm distance. Check below the tips for utilizing NFC tags. NFC tags do not work if they are placed directly on metal. Additional material (e.g. ferrite) is needed to insulate the metal from the tag. Alternative ways can be for example to lift the tag from the metal (about 1 cm) with plastic or other non-conducting materials to ensure the insulation. Different antennae are available for NFC tags. The size varies from a few millimeters up to the the size of a credit card. The antenna’s size depends also on the size of the phone and whether there are additional devices on the back of the phone (e.g. camera) or not. 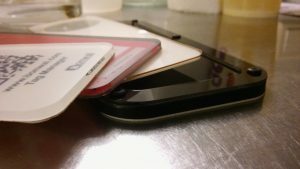 If the difference between the sizes of the active (NFC phone) and the passive tag (NFC tag) is rather big, it might be difficult to read the tag. 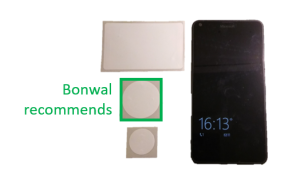 Therefore, Bonwal recommends that when the tags are read with mobile phones, the size of the antenna should be either 38 mm or 22 mm. In order to be able to read the tag easily with a mobile phone, the tags can be lifted 0,5 – 1 cm from a flat surface. This can be done for example by adding a plastic case to the tag. Due to the fact that NFC technology is still rather new and unknown among consumers, a visual symbol of NFC as well as an encouragement to “touch the NFC tag with their phone” should be attached to the tag. This helps your customers to use the tags. When people get familiar with the usage of NFC tags, they are considered even easier to use than QR codes. There are various types of RFID/NFC tags in the market. All of them have different features, for example the size of the memory. The table below clarifies which types are recommended by Bonwal. 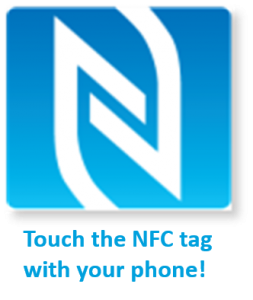 More information on NFC tags you can find from NFC Forum and NFC World.